Cakespy: First off--how do you feel with the opening just around the corner? Kari Haskell: It's my adult dream come true (my teenage self had NO idea that I would want to go back to a type of small town living)! I grew up in a small town in Oregon that had a main street (Third St. in McMinnville, OR), and my grandparents owned two business there: a pharmacy and a grill restaurant. I would walk there all the time and pick up $.25 candy or Hallmark cards or whatever. I also wanted to leave that kind of life the SECOND I got out of college (I went to college in a small town too!). I moved to Southern California and met my husband, Brian, and then we began a life of climbing the ladder of corporate restaurants. Brian was a GM of Red Robin for 8 years and an Assistant GM for BJ's Brewhouse for all of last year. All of this while I stayed home and raised our girls, Abbi (9) and Lucy (2)...while watching him work 12-14 hour shifts five (sometimes six) days a week and sometimes commuting two hours (back in the California days)! We're used to long hours! Having our commute be three minutes (10 by walking) is fantastic. It's created that small-town feel again that I totally craved after being controlled by a corporate entity for so long!! No one will tell us where we should move to "move up" ever again! That is the MOST exciting part for Brian. My exciting part? Being the neighborhood bakery that my neighbors and friends can enjoy! Now I know why my grandparents LOVED their work so much. It's so great to be so close, know your customers, and actually be a part of where you live. CS: Can you tell us a bit about how you decided to open Retro Bakery? KH: I've been baking since I was a Sophomore in high school, when we had to bake a cake and a pie from scratch. The task at first seemed completely impossible to me. I thought cake only came from a box. After I baked my first pie, I was hooked. I started baking the pies for every holiday every year. I still use the same crust recipe from that Food 101 class. It's truly the BEST, and I've tried them all. The cake part came later. For some reason, I was intimidated by cake: it could fall; it would be lumpy or sideways...too many variables. Fast forward 14 years, and I meet Kristie Fleisher who is the BEST cook I know. Kristie is always into trying new recipes and new ideas. Last year, she was trying baking cakes from scratch, and she totally inspired me. I started baking cakes in my kitchen, and realized it wasn't as hard as my teenage self thought! 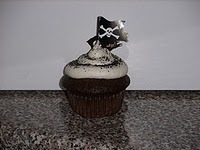 I then noticed that EVERYTHING I was reading in the news or on TV was about cupcakes! That got me thinking about flavors and ideas that could work with cupcakes (cakes were just too big to test on...and cupcakes are WAY cuter!) I started researching ideas of what was out there already (WAY more than I thought! ), and I found that my ideas where pretty unique, and tasted good enough to sell! Then I realized that cupcakes were literally taking over the world, and between my baking talent and my husband's restaurant knowledge, we could do this! We are so lucky to be in a big city like Las Vegas, but even luckier to be in a section of town that is growing so rapidly and doesn't have a lot of established businesses yet. Our neighbors are always hungry for something new, especially if it's a family-owned store! CS: Can you tell us some of the ways that the "Retro" aspect will be played out in the retail location? 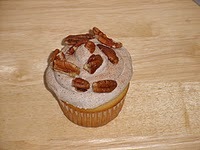 KH: The name Retro Bakery comes from my love of the "Atomic Era" of the 1950s and early 1960s. I have always loved the bold colors, simplicity of design, and "Tupperware Party" quality of life. 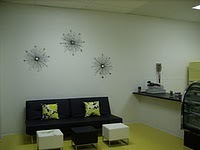 I used that aesthetic in the bakery decor: clean, simple, bold design. I also try to have "retro" flavors (not necessarily from the '50s...): Mint Chocolate Chip, Peanut Buttercup, Coffee and Donuts, Peanut Butter and Honey (my favorite sandwich of ALL TIME), and Cinnamon Toast (just to name a few)! CS: It looks like your focus will be cupcakes, but will you be offering other baked goods at Retro Bakery? KH: I like to focus on cupcakes because they are so cute and small (and also VERY popular right now), and also because I LOVE them! It's the perfect dessert! 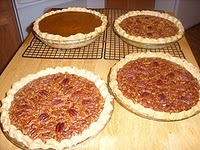 I will offer pies year-round by special order, but we will have a "Pie Season" during the holidays when I will exclusively do pies (Double Pecan and Spicy Pumpkin) and only have cupcakes by special order. 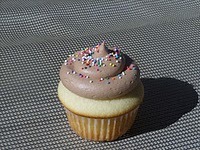 We can also bake any of our cupcake flavors into 9-inch, double-layer cakes because some people will always want a cake! 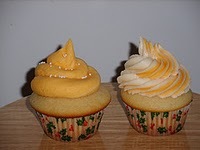 CS: You've been trying out some really fun recipes (creamsicle cupcakes, caramel corn cupcakes, etc)--which one are you most excited about? KH: Honestly, every time I try a flavor, THAT'S my favorite. It's so funny...I'll bake it and say, "OH! Now THIS is my favorite!" I'm most excited about the next one knockin' around in my head...I literally DREAM about flavors, so I have quite a few waiting to be created. My latest, Caramel Corn, was a HUGE hit...so much so, I almost called my menu printer and halted printing, so I could add it to my regular menu! But, we decided that it could wait, and we'll probably have it as one of our "Seasonal Flavors" that will change every month...I'm thinking May or June in honor of baseball season. The cool part is that it's OUR decision to make! CS: How do you decide which flavors make the cut? 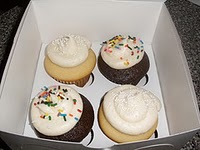 KH: Many tests with my family and friends...I think they may be tired of my shoving cupcakes in their faces! Cakespy Note: Somehow we doubt that anyone is getting tired of having cupcakes shoved in their faces. CS: Are there any bakers, cookbooks or websites in particular that inspire you? KH: My Great Auntie Marm is my baking inspiration. She's been baking bread and goodies for the entire town of McMinnville, OR, for the last 60 years! As far as websites: CAKESPY, of course (Cakespy Note: We did not pay for or bribe Kari in any way to say that. Really. What can we say, the girl's got good taste)! As well as Cupcakes Take the Cake. Both of those have SO many inspirational interviews, flavor ideas, decorating ideas....it TOTALLY sparks my imagination. Also, many people on flickr.com. There are too many to mention...but I look at EVERYONE to see new trends coming or if my stuff can measure up! CS: What types of pastries are popular in Las Vegas? Any local specialties? KH: This is a tough question, since I don't actively seek out pastries. I'm a salt-a-holic! I can tell you where the best french fries are (BJ's and Red Robin)! Las Vegas is truly a divided place: Locals and Tourists. The Strip is full of gourmet pastry chefs making spectacular stuff....but locals really have limited places to find baked goods. I've found Cakes by Ruth, Nothing Bundt Cakes, and Cake World to have the best cakes. I'm sure there are others, but not up in Centennial Hills. CS: Be honest. Which do you like better, pie or cake? CS: To you, what is the most important aspect in making a quality baked good? KH: FLAVOR and MOISTURE. I love making flavors people don't expect for cupcakes, and in this desert climate, it's a constant battle to keep your cakes MOIST! 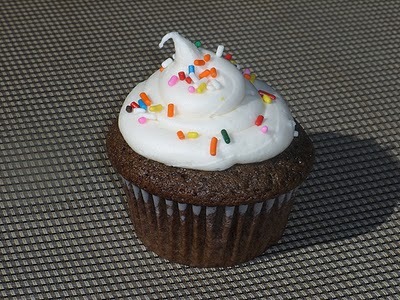 CS: With regard to cupcakes and cakes, there is some controversy about the temperature at which they should be served. In your opinion, should they be chilled, or room temperature? KH: I know why some are chilled now! Cream cheese frostings are required to be chilled (Health Department rules!). I prefer room temp and also a day old! Weird, I know. But I like a little crunch in my frosting...and I really don't like cream cheese frosting. This could get me in a lot of trouble! CS: Out of pure nosiness--when you're not baking, what are some of your other interests or hobbies? KH: Decorating is my second passion. (I'm totally inspired by Todd Oldham right now!) I also LOVE writing. 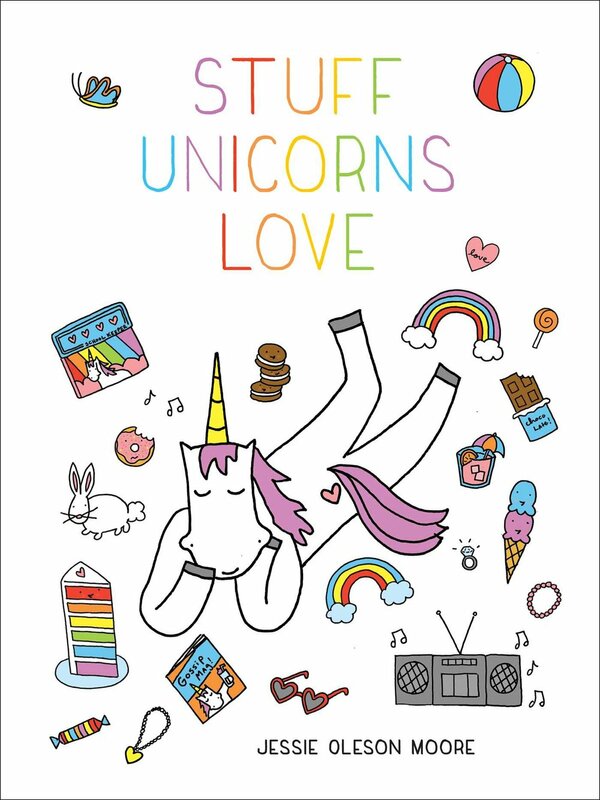 I totally in love with all things BLOG. CS: One of your employees, Kristie, is listed as Cake Specialist / Head Cheerleader. We're intrigued. Does this mean she majored in culinary arts and minored in Rockette arts? KH: She has been my biggest supporter from DAY ONE. She's my go-to if I have cake problems...or mental problems. CS: If you could go back in time and give yourself advice when you were just starting out with this project, what advice would you give? KH: It's going to cost more than you think! You hear that one all the time, but IT WILL! We were thinking $50K, but that was just us not knowing ANYTHING about city codes, leasing spaces, appliances...now we know! It all adds up QUICKLY! Are you in the Las Vegas area? 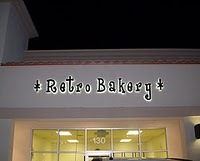 Lucky you; Retro Bakery is located at 7785 N. Durango Drive, #130, Las Vegas; online at retrobakerylv.com. Not in Las Vegas? Happily, you can still catch a sugar high by checking out their blog at buildingabakery.blogspot.com, or by browsing their drool-worthy Flickr photos at flickr.com/photos/retrobakery.